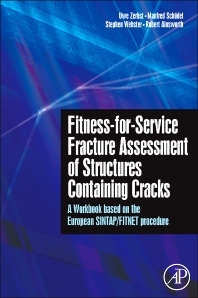 The purpose of Fitness-for-Service Fracture Assessment of Structures Containing Cracks is to facilitate the use of fracture mechanics based failure assessment procedures for the evaluation and design of structures and components. All practical structures contain flaws and the optimum combination of cost efficiency and safety whilst achieving the required capability, can only be realised by using state of the art methods such as that represented by the European flaw assessment method SINTAP/FITNET to analyse the safety risk. This book is written by practitioners with extensive experience in both the development and use of integrity assessment methods and provides comprehensive information on the basic principles and use of analytical flaw assessment. It provides an introduction to the method, its background, how it can be applied, its potential and, importantly, its limitations. The explanations are complimented by using a large number of worked examples and validation exercises which illustrate all aspects of the procedure. In addition, for students and engineers who are new to the subject, a comprehensive glossary of basic terms used in fracture mechanics based integrity evaluations is included. University researchers (materials, engineering, mechanics). Researchers in interdisciplinary areas of structural integrity, damage tolerance, failure analysis, NDT. Practitioners in industry such as energy supply, aerospace, chemistry, petrochemicals, pipelines, offshore structures, railways. The authors should be commended for making a very useful contribution to the area of fracture assessment of metallic structures. The book comprises a good mix of theory and practical procedures, which are complimented by many worked examples and validation exercises." --Dr Xiang Zhang, Cranfield University, U.K.